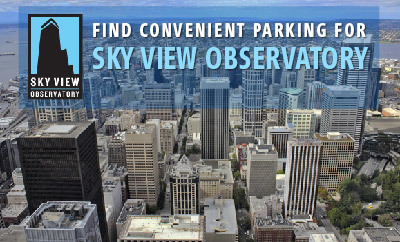 Parking.com offers convenient parking for the Sky View Observatory. Click on the location below for parking information like rates, hours and directions. The Sky View Observatory is located on the 73rd Floor of the Columbia Center in Seattle. At over 900 feet with a 360-degree view, The Sky View Observatory is the highest public observation area on the West Coast. Parking.com offers convenient parking throughout the Seattle Downtown area.